Have you started your journey into the Wild Hunt world yet? If not, try it out for FREE. 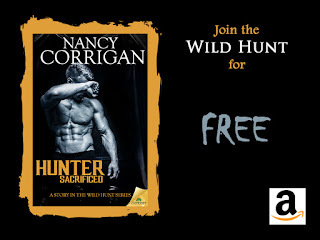 Download Hunter Sacrificed now! Arawn, Lord of the Underworld, is faced with the hardest decision of his long life. Because of his neglect, humans are suffering…but his vow to make things right could cost him everything he holds dear. Minerva, the Goddess of Love, holds his heart and soul, but the act he must now commit might very well destroy their love. His sacrifice doesn’t go far enough to end the humans’ agony. It compounds it—and turns him into a pawn. He cannot renege on his deal with the Triad, but he can avenge those he’s wronged. To do that, he’ll need every one of his Huntsmen to win the greatest game of all time—the Wild Hunt. Warning: Goodness and light vs. sacrifice and darkness. Seriously, what could possibly go wrong? The Library Journal on the Wild Hunt series -- "...intriguing and original...Recommended for those whose traditional sexual values just need a little boost."